George Karra was born in Israel in 1952. In 1969 he graduated from Eshkolit High School in Jaffa. In 1973 he earned his law degree from the Tel Aviv University Faculty of Law. He interned from 1972 to 1974, and was subsequently admitted to the Israeli Bar in 1975. From 1975 to 1989 he practiced law. In 1989 he was appointed to the Tel Aviv-Jaffa Magistrates’ Court and in 2000 he was appointed to the Tel Aviv-Jaffa District Court. In 2010 he was appointed Senior Judge of the Tel Aviv-Jaffa District Court, and in 2013 he was appointed Deputy President of that court. 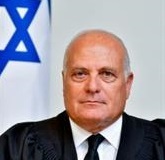 In June 2017 he was appointed as a Justice of the Supreme Court of Israel.